Researcher Emilie Stump (@EmilieStump) investigated habitat use by seahorses and pipefishes (family Syngnathidae) in Biscayne National Park to advance conservation of these species and their ecosystems, and to attract public support for this critical marine area. Biscayne National Park (BNP) provides a unique opportunity to study these charismatic fishes because of its broad representation of vulnerable habitats, high diversity of seahorses and pipefishes and prohibition on collection for the aquarium or curio trade within the park. In turn knowledge of spatial distribution and use by syngnathids should help influence spatial planning in BNP, including protected area design. 2) In collaboration with local south Florida scientists, investigate changes in syngnathid distribution over time and seasonal patterns of abundance. My research team and I conducted timed roving diver surveys in Biscayne National Park from May to September 2016. Local experts and knowledge were consulted during the site selection process to maximize the likelihood of finding syngnathids and to ensure adequate sampling of major habitat types in the park. Survey sites presented major habitat types found in BNP – continuous seagrass beds, discontinuous or patchy seagrass beds, and coral reefs. One of the biggest challenges faced by syngnathid researchers is finding these animals. Many species of seahorses and pipefishes are rare, either because they naturally do not occur at very high densities or because they have been depleted from a particular area. In addition, seahorses and pipefishes are masters of camouflage, using both their color and their behavior to blend into the surrounding environment. Repeat surveys were conducted at each site, and were designed based on the latest research in detection of rare and cryptic marine species. We surveyed nearly 80 sites and collected records of 147 individuals of eight different species of seahorses and pipefishes. The most commonly recorded species were the dwarf seahorse (H zosterae), the Gulf Pipefish (S. scovelli), and the Dusky Pipefish (S. floridae). 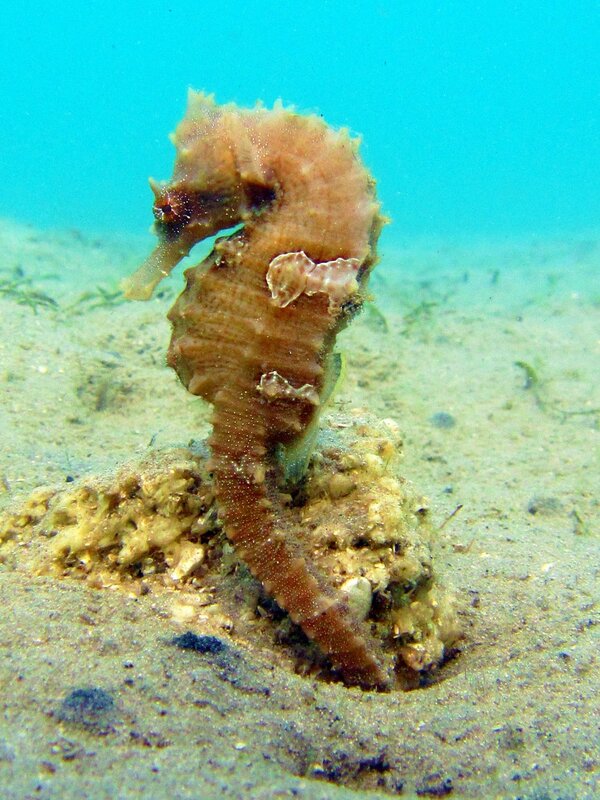 The researchers found that seagrass beds are an important habitat for a number of seahorse and pipefish species. There were no seahorses or pipefishes recorded in coral reef habitats, however it is likely that this reflects low sampling; our study was designed to sample reefs proportional to their occurrence in BNP. Literature evidence suggests that syngnathids are likely to occur in coral reef habitats. I will examine trends in the distribution of syngnathids over time and patterns in the seasonal distribution of syngnathids at 45 additional sites along the coast of Biscayne Bay in collaboration with NOAA’s Protected Resources Division. What do these results mean and where to next? We found that seagrass beds are an important for a number of seahorse and pipefish species. 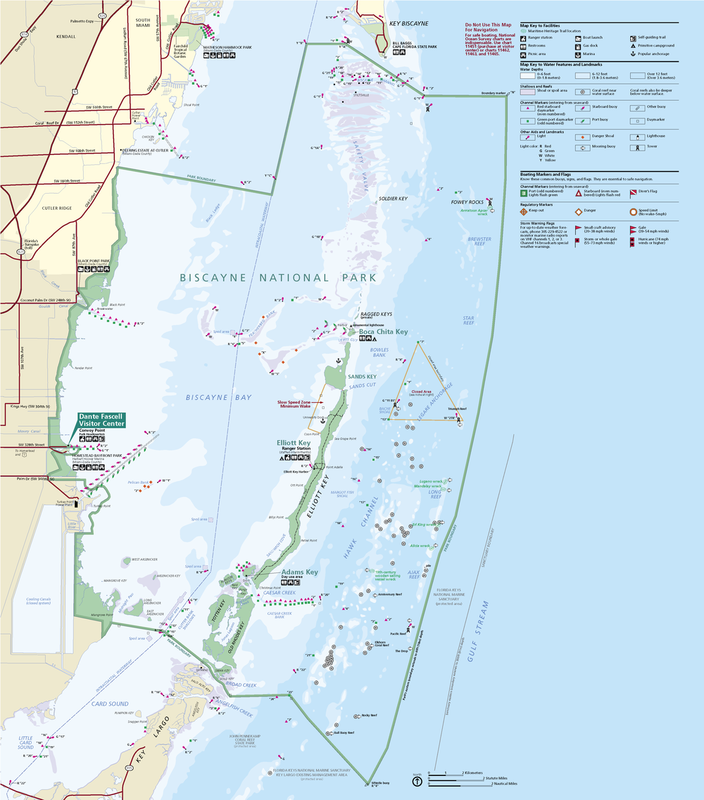 These habitats provide important ecosystem functions in Biscayne National Park. 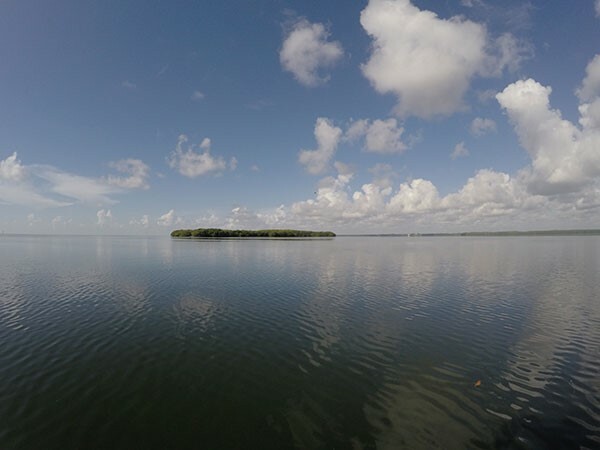 Seagrass habitats in Biscayne National Park face a number of stressors including recurring algal blooms due to excessive nutrients, physical damage due to propeller scarring, and altered hydrology due to diversion of freshwater from the system. Through this research and subsequent outreach efforts, Project Seahorse and I hope to solidify the seahorse as a powerful and captivating symbol of Biscayne National Park. The Project Seahorse team and I have tailored a conservation outreach campaign “Seahorses: Magical Creatures in Our Backyard” to audiences in south Florida. For more information please visit our campaign website here. My research to study habitat use of seahorses and pipefish took me to Biscayne National Park in South Florida. It is the largest marine national park in the US and supports incredible biodiversity. The park protects vital marine habitat and nursery environments including mangroves, seagrasses and coral reefs. We spent considerable time consulting local stakeholders such as divers, long-term residents, fishers and scientists about prior knowledge of seahorse distribution inside Biscayne National Park. Based on local knowledge we decided to survey in three habitats - coral reefs, seagrass beds and discontinuous seagrass beds. Here is a typical scene from our coral reef habitat. 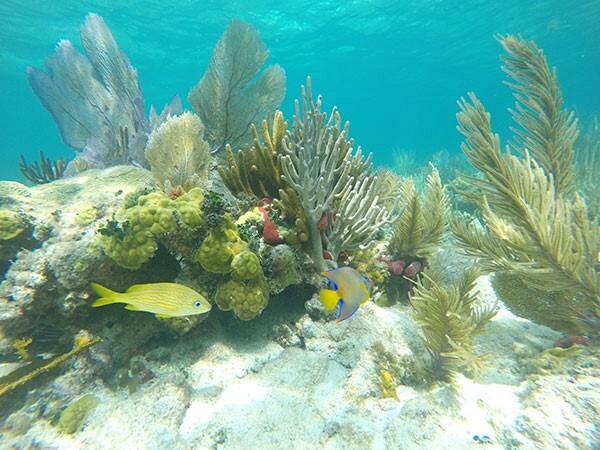 Biscayne National Park protects much of the northern-most extent of the fragile Florida Reef Tract, and has over 500 species of reef fish. Will we find seahorses here? We searched 79 different sites for seahorses and pipefish (Syngnathids), including this continuous seagrass bed. We conducted timed roving diver surveys using scuba to systematically search for our elusive fishes. Our surveys for seahorses and pipefish were a great success. We found a total of 127 individuals from eight different species, including two seahorse species – the lined seahorse (H. erectus and the dwarf seahorse H. zosterae. Here, a lined seahorse, H. erectus, attempts to blend in with the seagrass. Although the coral reefs of Biscayne National Park are a good place to find this Federally Threatened type of Elkhorn coral, Acropora palmata, we observed no seahorses or pipefish in coral reef habitats. Instead, we found the highest number of Syngnathids in seagrass beds. I had four amazing research assistants while working in Biscayne National Park. Here we are getting ready for a dive at one of the coral reef sites. My assistants had a wealth of local knowledge about important ocean issues in South Florida, and thankfully for my research, a keen eye for spotting seahorses and pipefish. 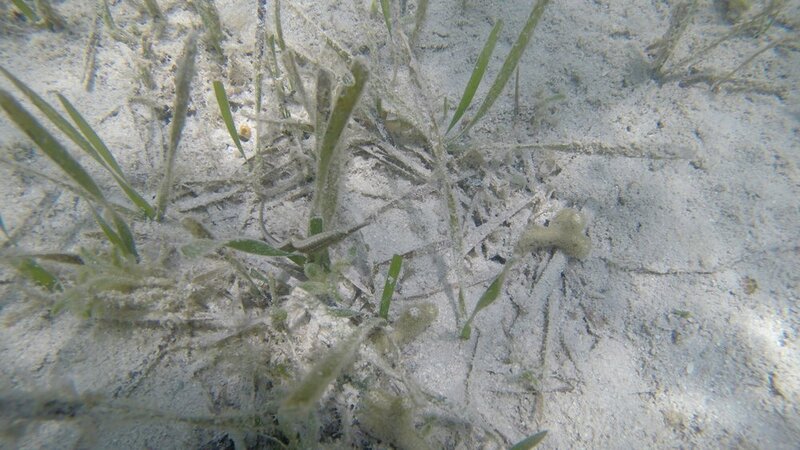 Can you find the pipefish, Syngnathus floridae, hiding in the seagrass? We found six different species of pipefish in Biscayne National Park, in both seagrass and discontinuous seagrass beds. The species featured in this photo was one of the most frequently encountered pipefish.